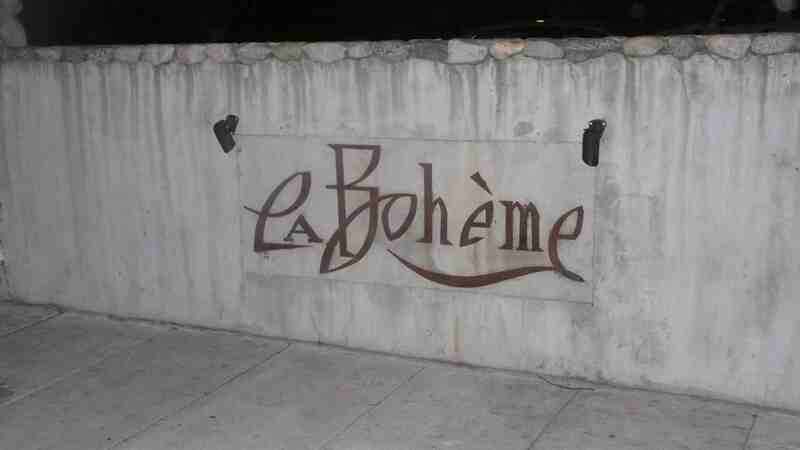 Last night, I visited Cafe La Boheme to dine and get some info for a new iphone app I am writing on LA dining. The newly redesigned interior is mesmerizing, opulent and comfortable. The restaurant houses five grand chandeliers suspended from the high wooden plank ceiling into the dining space below with two huge open fireplaces. Seating is in three spots, the crimson colored dining room, upstairs in cozy balcony tables overlooking the action below, or outside in the lush patio. 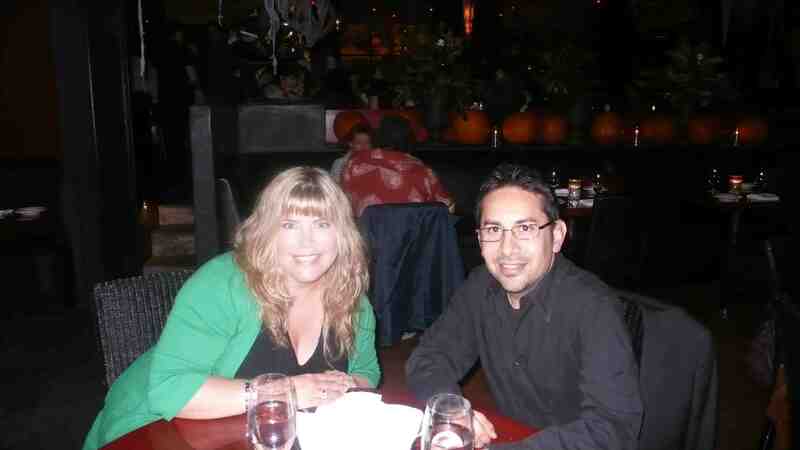 My friend Dalbert and I opted for the dining room seating which was decked out in Halloween decor. 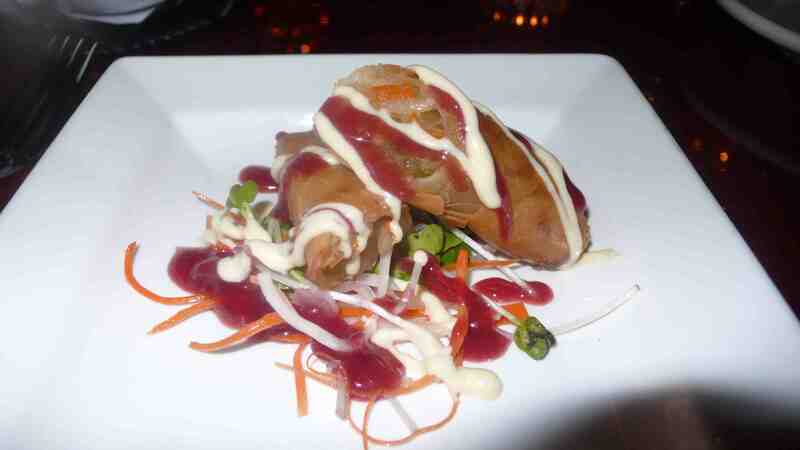 We started with an amuse of a crispy vegetable spring roll. 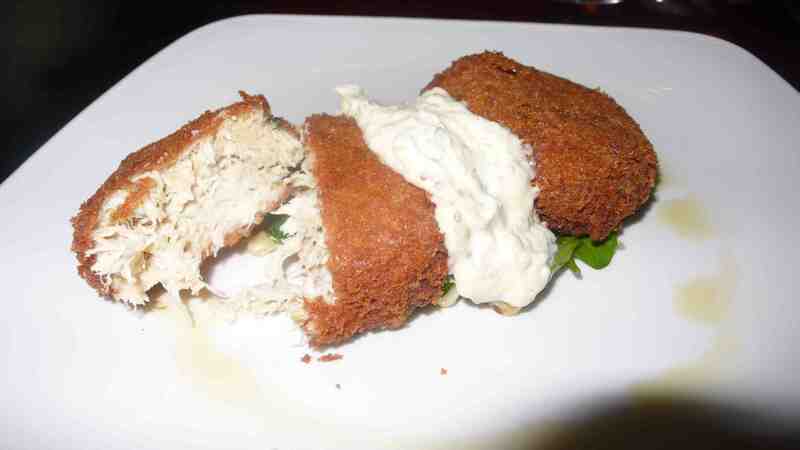 Next came appetizers, Dalbert ordered the Maryland crab cakes with a sauteed corn salad and spicy remoulade. 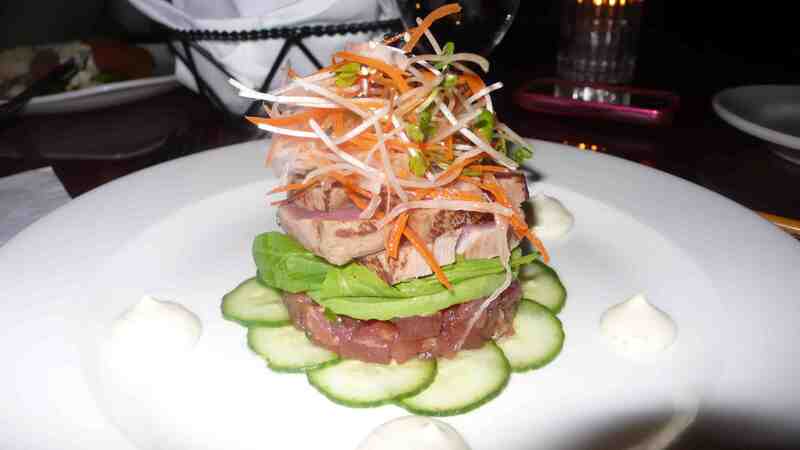 I had the tuna tataki, a beautiful tower of tuna tartare, avocado, cucumber and wasabi mayonaisse. Both were delicious. 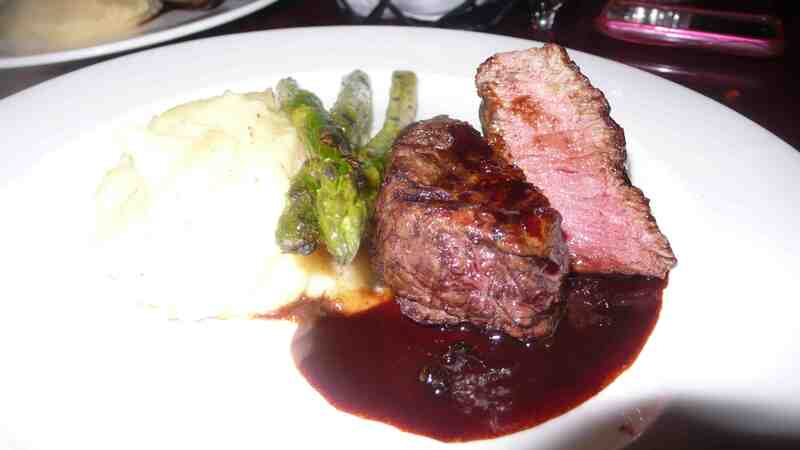 We both ordered the special filet mignon with whiskey peppercorn sauce and horseradish mashed potatoes and grilled asparagus for our entrees. It was the special of the night and hard to resist. 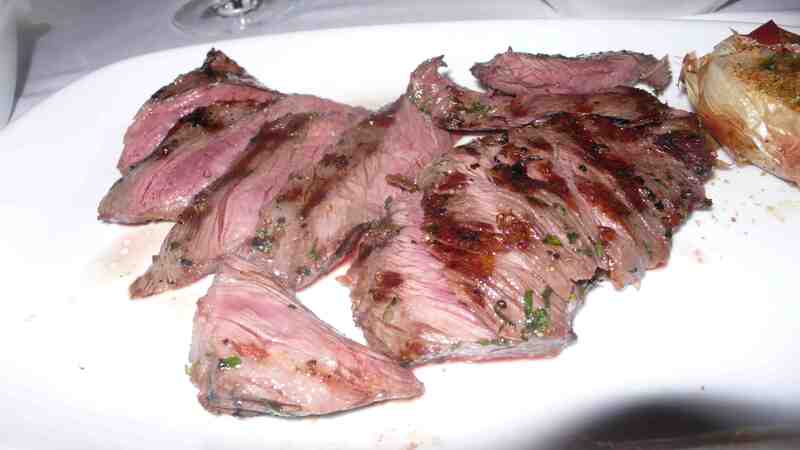 We also had a really nice bottle of La Crema pinot noir to go with our steaks, which paired perfectly. 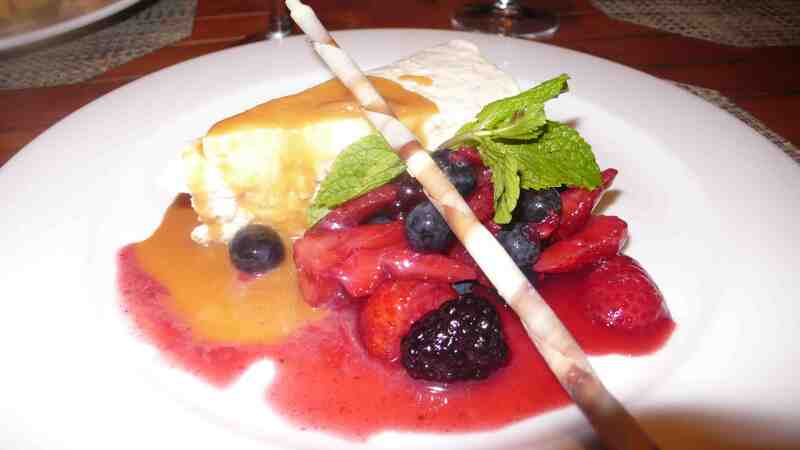 We were forced to get dessert, well… not really forced but the choices looked so good that we had to order something. 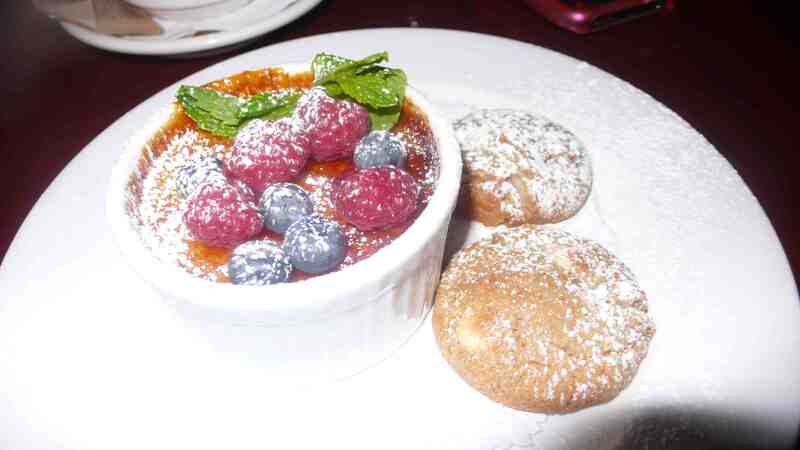 I opted for the vanilla creme brulee with berries and Dalbert got the savory chocolate chip bread pudding. Both were sweet and yummy. 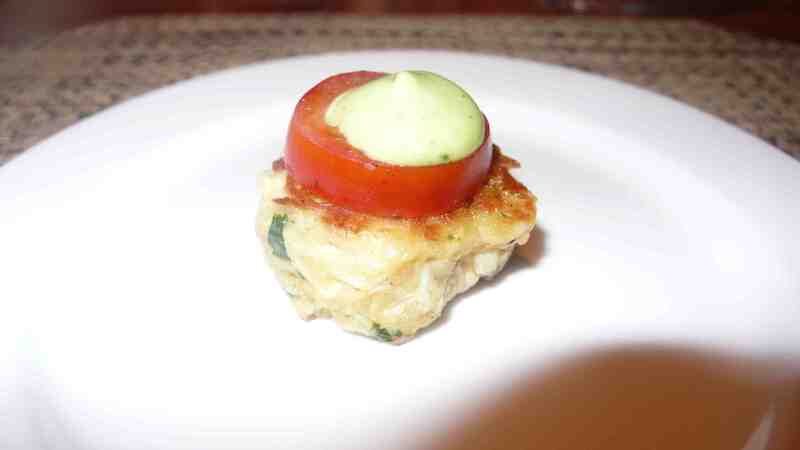 We started with a amuse from the chef – a baby crab cake topped with a slice of tomato. 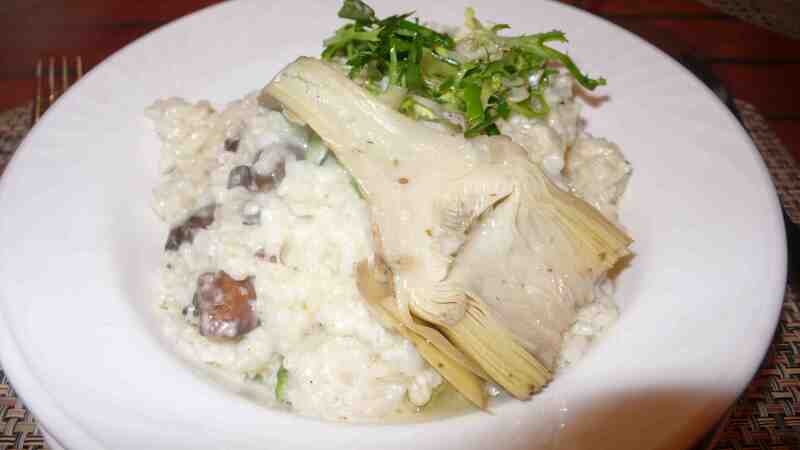 Next came starters – mushroom artichoke heart risotto for me and clams and scallops for Paul. 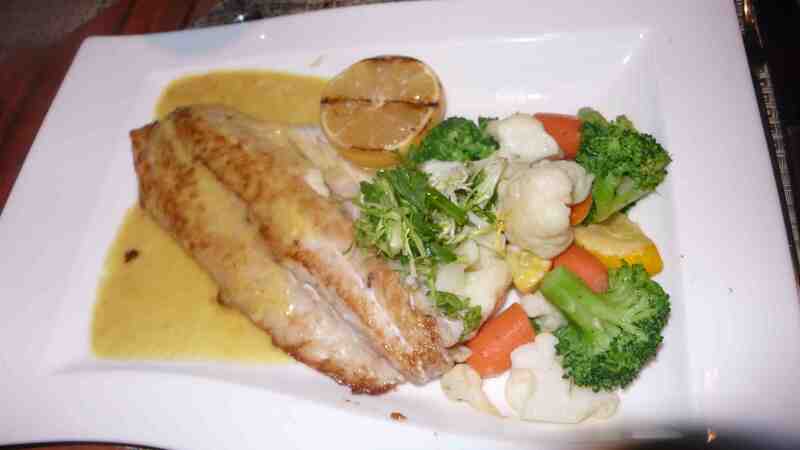 Paul had the striped bass and I opted for the strip steak, both were very good. 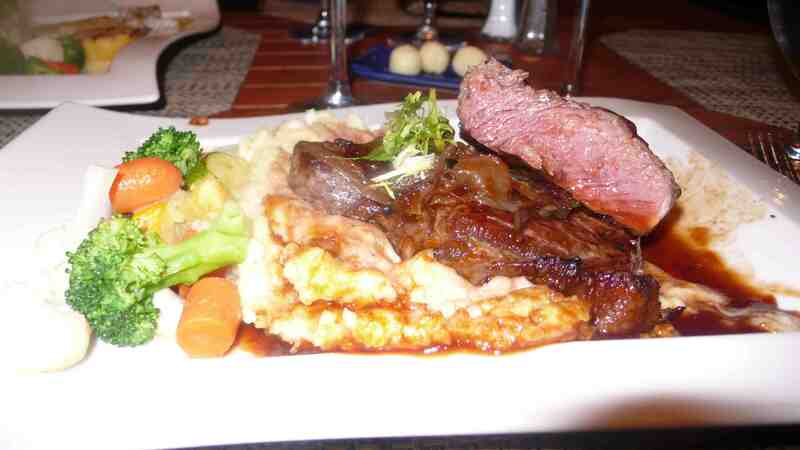 The real star at the restaurant is the view, overlooking the many water features and towering mountains. A perfect place to watch the sunset in the desert. 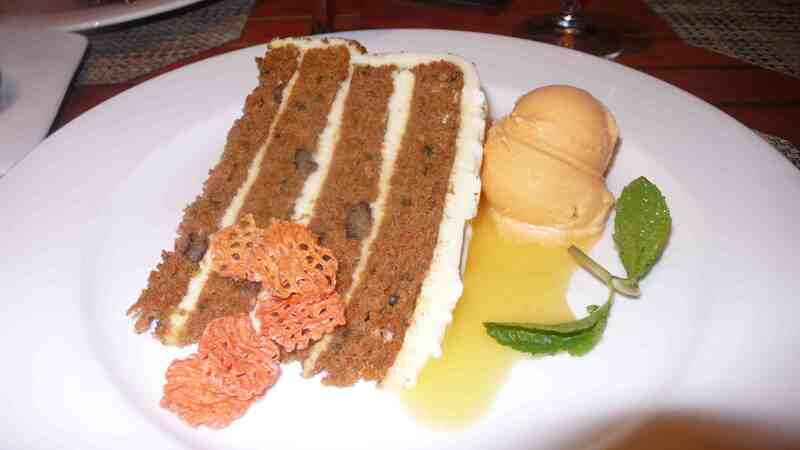 After our main courses, we ordered desserts of carrot cake and rice pudding. 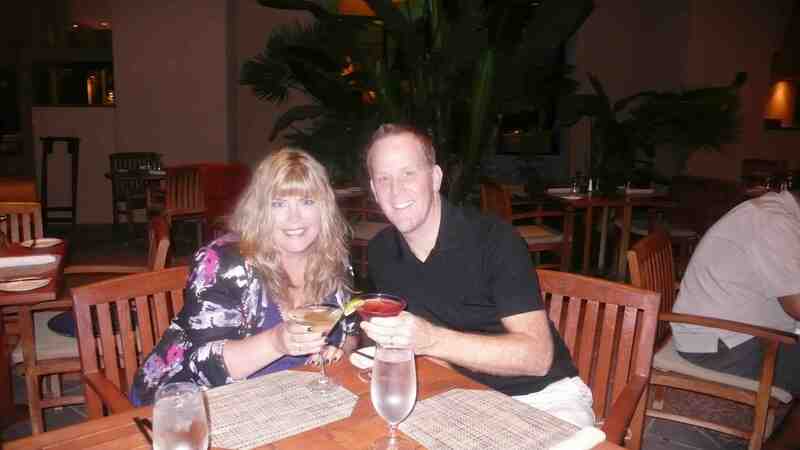 If you are in the desert area, it’s worth a visit during sunset to stop in for dinner or a drink on the patio. 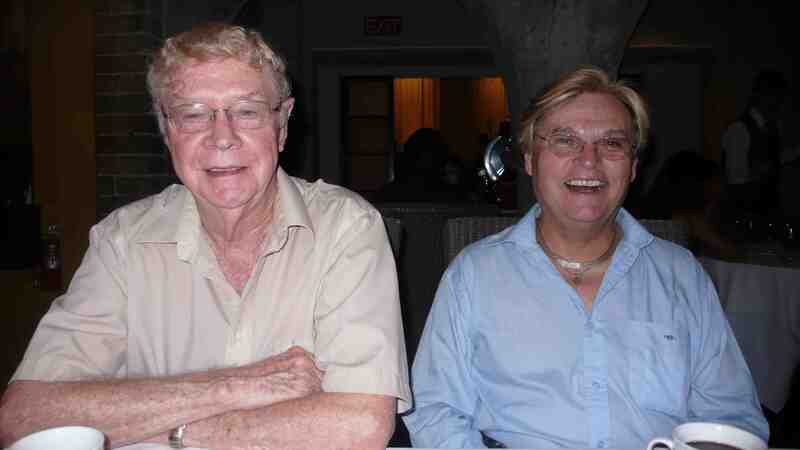 Bella Vista is located at 7133 Dinah Shore Drive, rancho Mirage, CA, 760/328-5955. 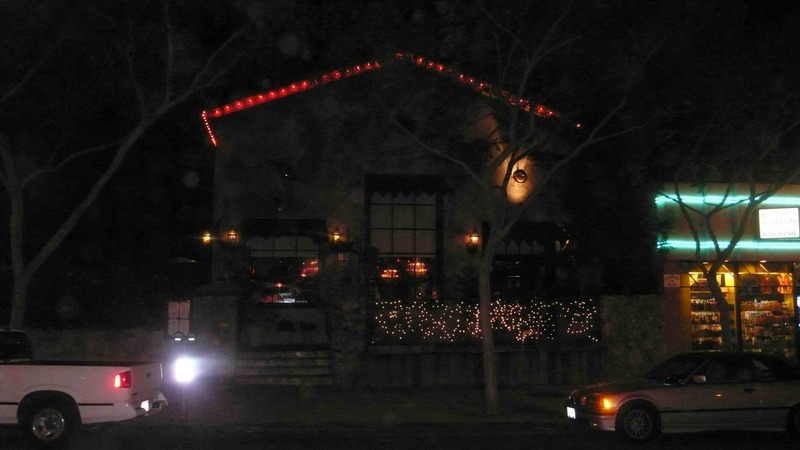 Last weekend after visiting Campanile, I headed out the next night for dinner at Mark Peel’s other restaurant (with co-owner chef Suzanne Tracht) JAR. I had heard great things about the eatery for a long time and decided to try it out. 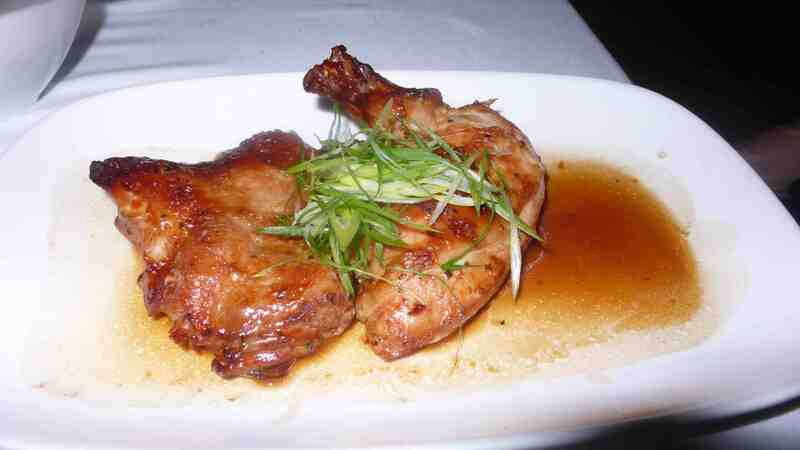 It is one of LA’s best for dishing up familiar comforting food. The minamilist decor of browns and pastel green and yellows with orange hanging globe track lights creates a romantic retro-modish ambiance, where steaks and chops are featured heavily on the menu. The crab deviled eggs, juicy pot roast, lemongrass chicken and marinated skirt steak are served with creamed spinach, duck fried rice, and mashed potato sides. 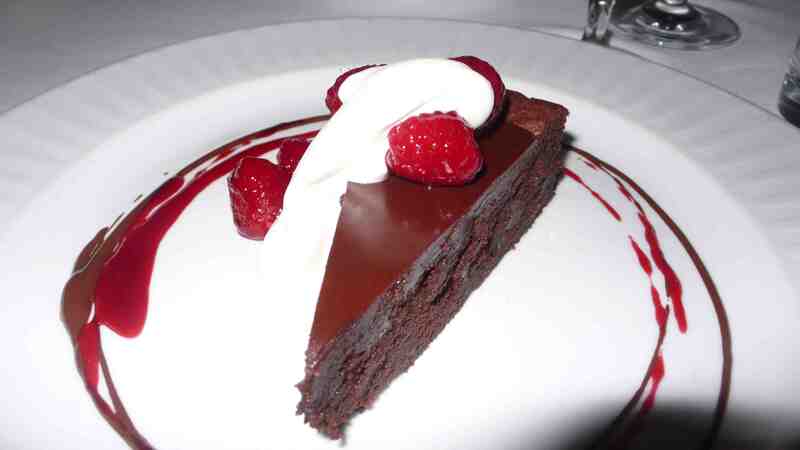 Desserts are also delicious, with chocolate mousse, banana cream pie and other faves to choose from. Here is what we sampled, all fabulous. 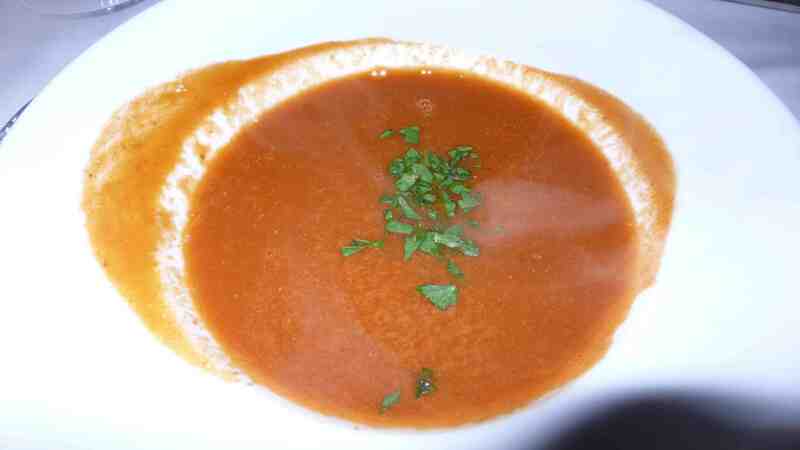 we started with the special appetizer, the lobster tomato soup, rich in lobster flavor but light because it has no cream. Very tasty. 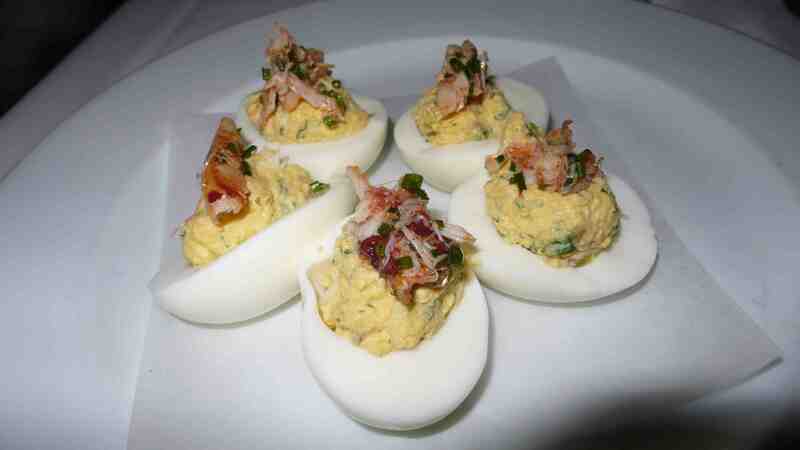 I love deviled eggs, so these crab deviled eggs were a real treat. My fave of the night. 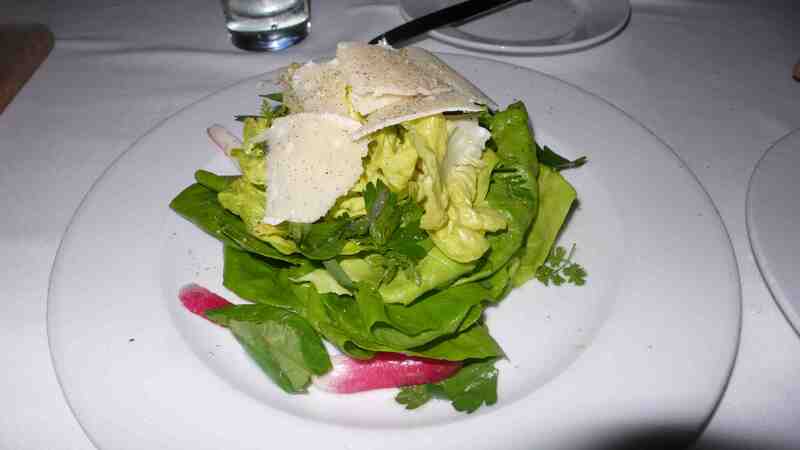 The butter lettuce salad was served with radishes, parmesan and a tangy lemon garlic vinaigrette. Our main courses were the lemongrass chicken with kaffir lime leaf sauce, very good, and the marinated skirt steak (which comes with a side sauce, choices include bearnaise, lobster bearnaise, tamarind, peppercorn and creamy horseradish). 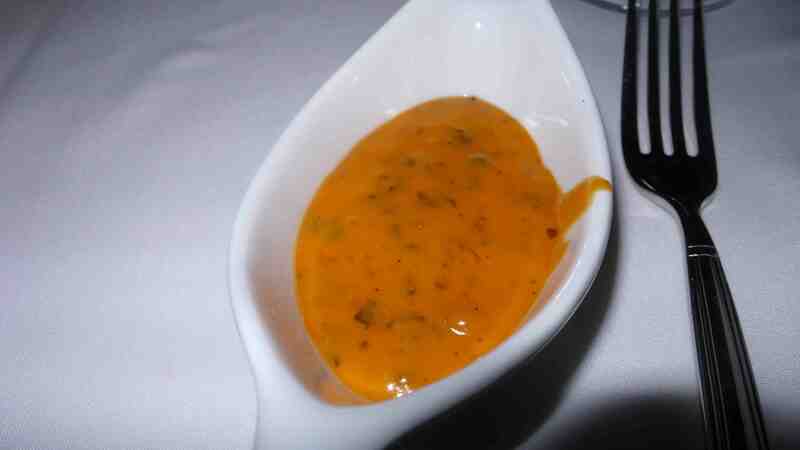 I had the lobster bearnaise sauce. 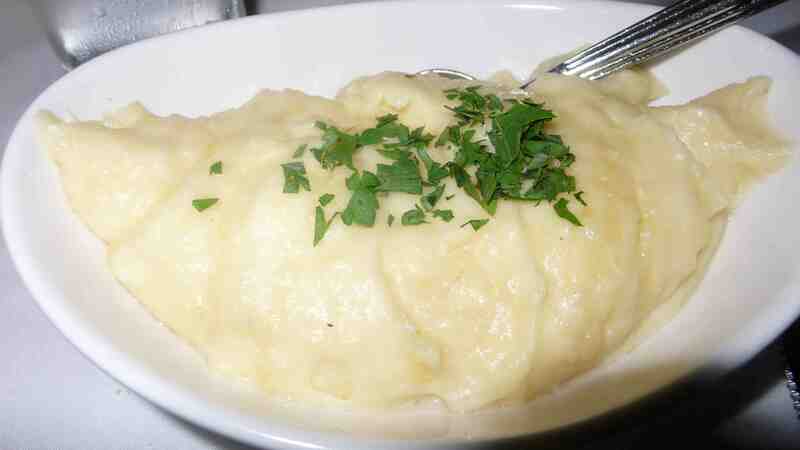 We also ordered some great side items, mashed potatoes and a medley of roasted mushrooms. 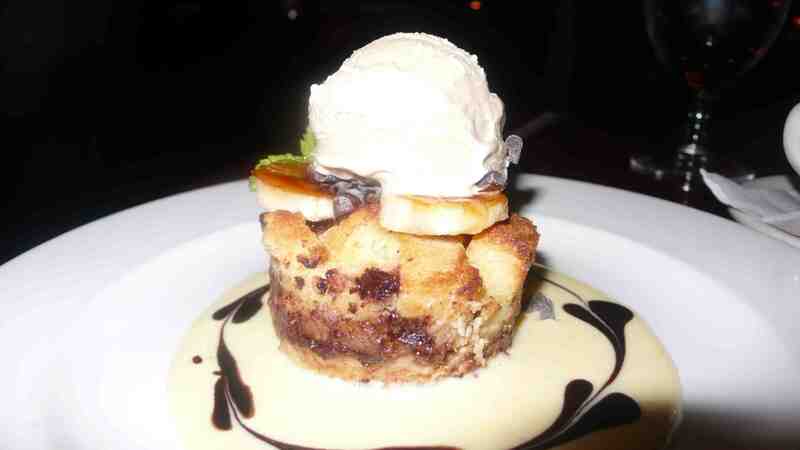 Both paired perfectly with our dishes. 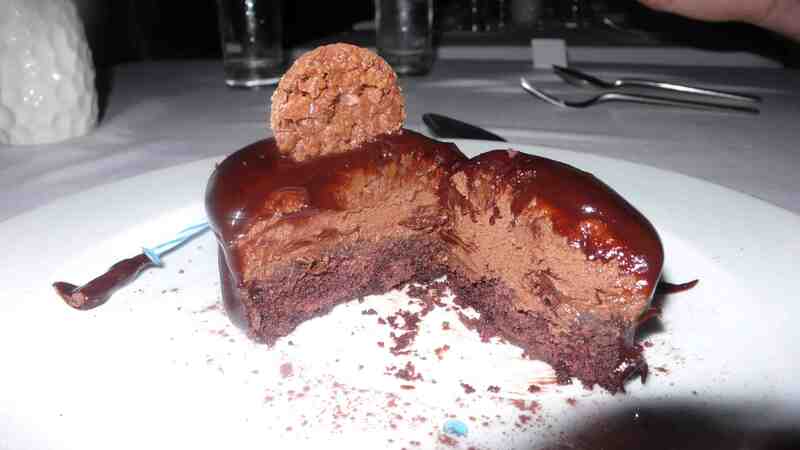 We ended the meal with a mouth watering chocolate mousse (my favorite dessert). If you crave your grandma’s classic comfort food but can’t cook it or get to nanna’s house, head to JAR for some tasty home cooked fare. 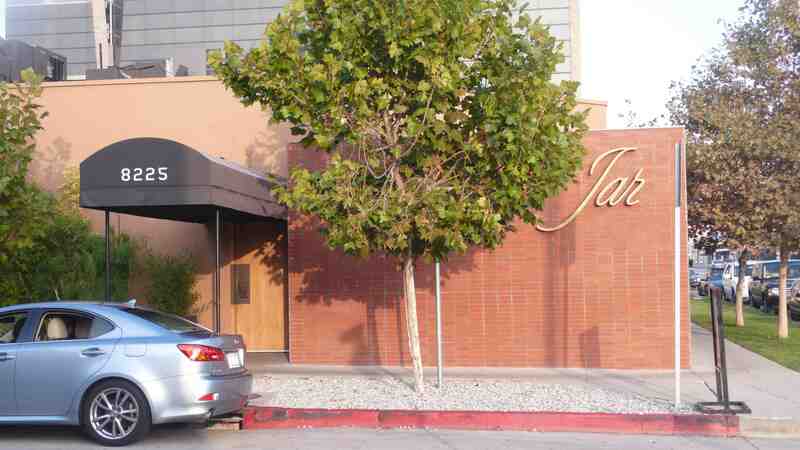 JAR is located at 8225 Beverly Boulevard, call 323-655-6566 for reservations. 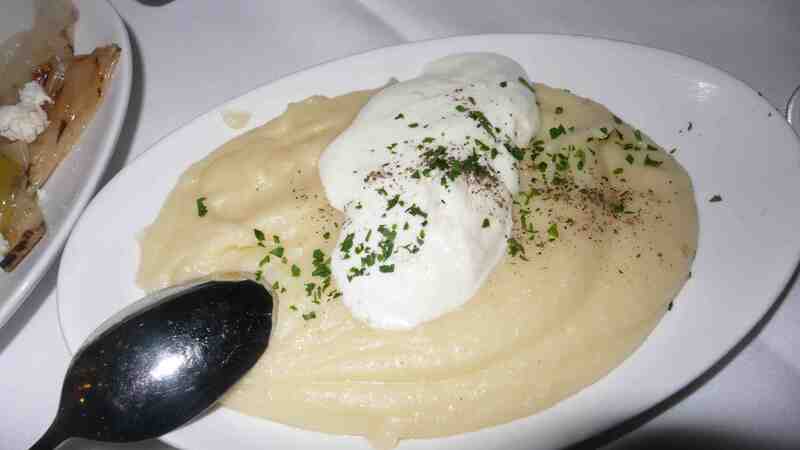 Last weekend I visited Mark Peel’s Campanile restaurant for two reasons, to review it for an upcoming iphone application I am working on and for a birthday celebration for my friend Mario (and me, we share the same birthday). 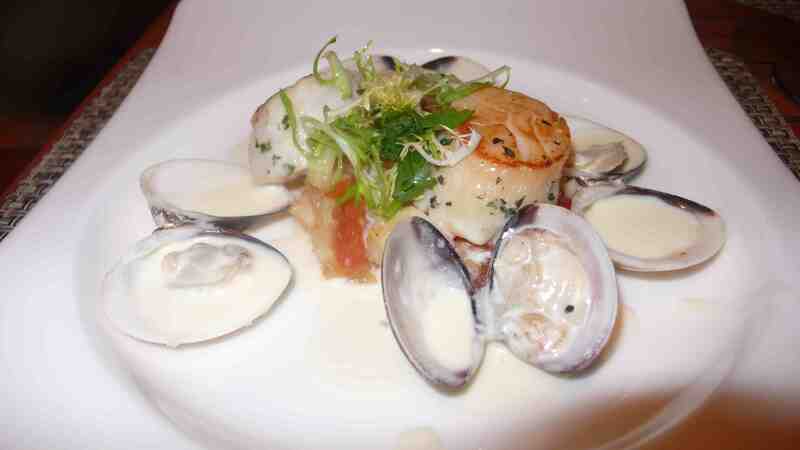 Opened in 1989 in a building from the early 20th century designed for Charlie Chaplin, Peel’s Campanile is reminiscent of a Mediterranean village. 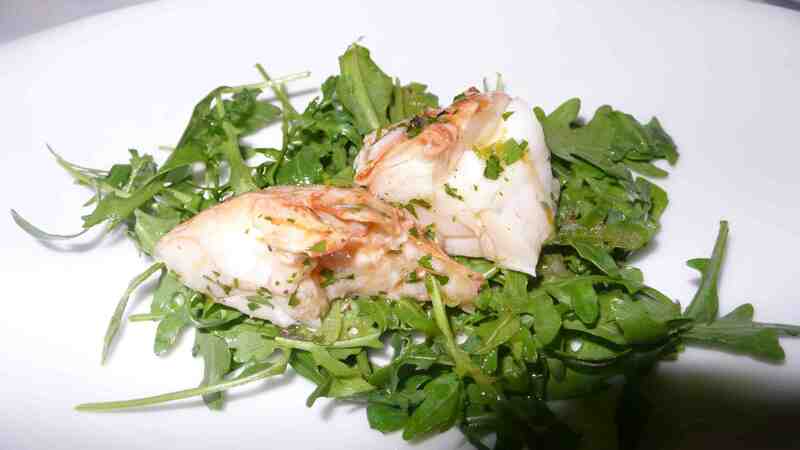 We started with a lovely amuse lobster salad from the chef. Big chunks of lobster so everyone was happy. 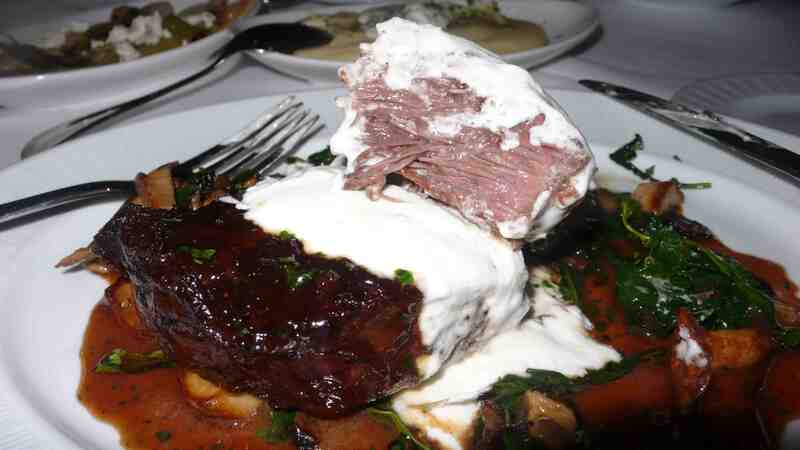 I had the braised short rib with horseradish sauce. Huge and delicious. 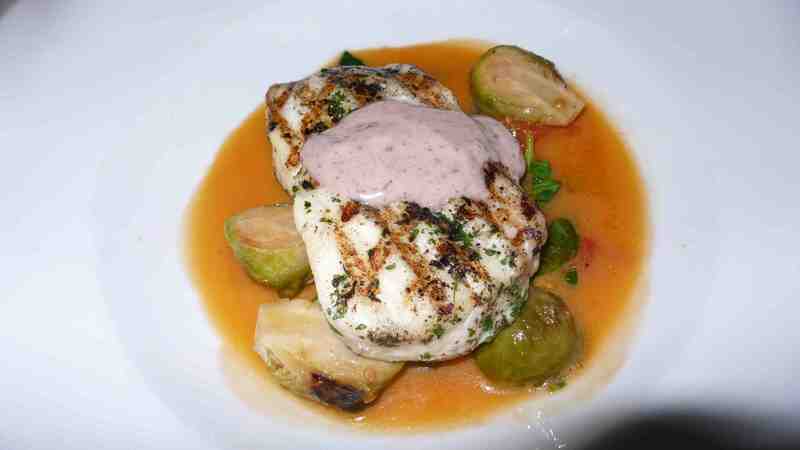 Mario and John had the grilled Alaskan halibut with braised fennel, tomato confit and spinach. I had a few bites, also very yummy with a lovely sauce. 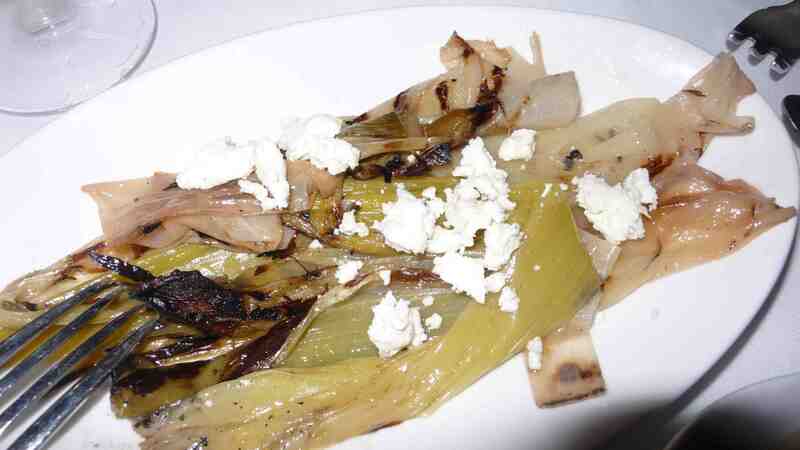 For sides we shared the mashed potatoes with shallot creme fraiche and the braised leeks with feta cheese. 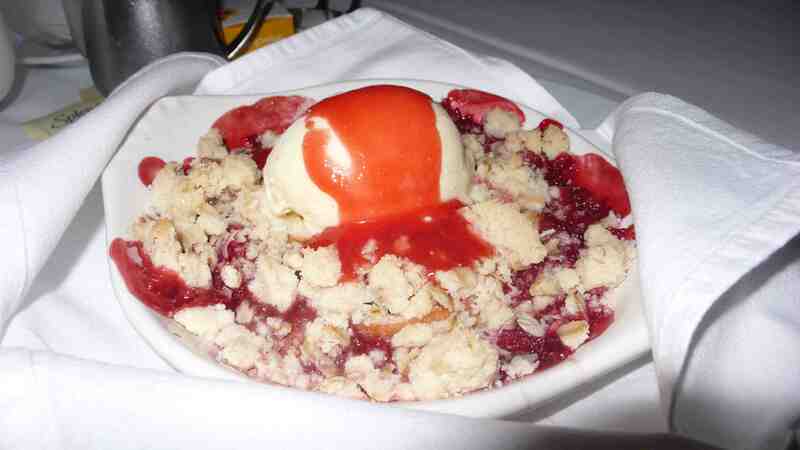 For dessert we shared the flourless chocolate cake (my fave) and a delicious apple and strawberry crisp. 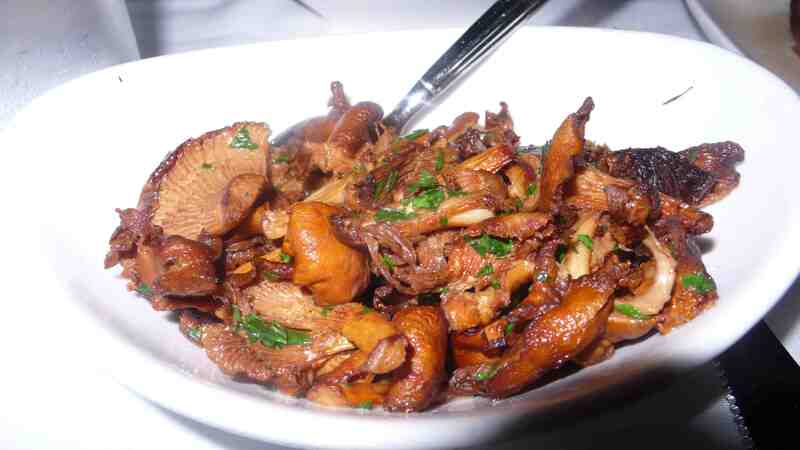 the Italian and French inspired menu changes often, and everything on it is delicious and homey, so anytime is a great time to dine at Campanile. Also, they have a fantastic brunch. This Monday, a special book signing and dinner is being held at the restaurant. Chef Mark Peel’s new book, “Classic Family Dinners” will be sold and signed by Peel, with a great dinner menu of grilled squid, potato and asparagus salad, leeks vinaigrette, or Waldorf salad for appetizer (diners can choose one option), giant ravioli with spinach, ricotta and egg yolk, cornmeal crusted pan fried trout, or pot pie (again, one choice), and chocolate pudding, apple cobbler or roasted figs with vanilla ice cream for dessert. The cost is only $39, a great deal, and reservations are a must. 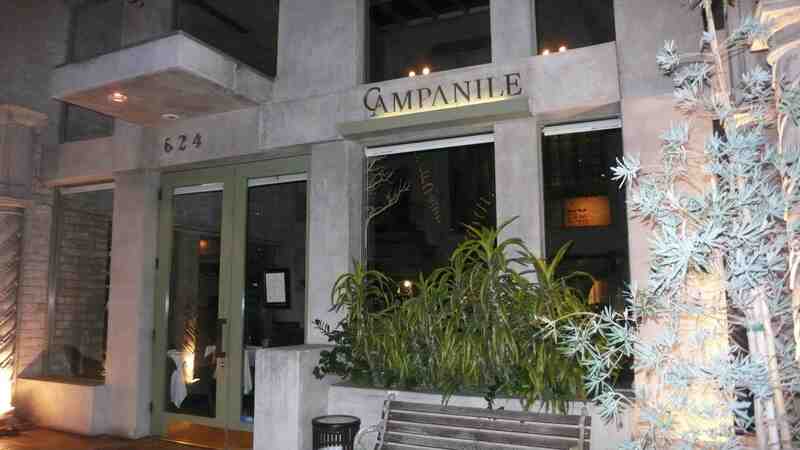 Campanile is located at 624 South La Brea, call 323.938.1447 for reservations. Signing event starts at 6pm.